Corestem said Wednesday that NeuroNata-R, its Lou Gehrig's disease therapy, also known as amyotrophic lateral sclerosis (ALS) treatment, has won orphan drug designation (ODD) in the EU. 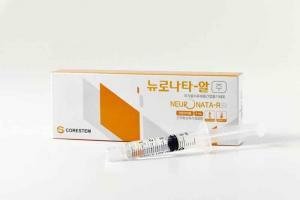 NeuroNata-R is a stem cell treatment for Lou Gehrig's disease that slows down the speed of body function’s decline by 50 percent after six months of prescription in a clinical trial. The drug received ODD in the U.S. in November last year and won sales approval in Korea in 2015. The European Medicines Agency grants ODD status to drugs that treat, prevent or diagnose life-threatening diseases with a prevalence of less than five per 10,000 people in the EU member states. If approved, the drug can reap benefits such as expedited review and fee reduction, which speed up winning the marketing approval after clinical trials. “The designation of ODD in Europe is significant as it certified the validity of the results from phase 1 and 2 clinical trials for NeuroNata-R conducted in Korea,” a company official said. The ODD has not only proved the company’s technology in developing NeuroNata-R, a rare medicinal product that has excellent therapeutic effects, but also demonstrated that a combination treatment of Riluzole, the main ingredient NeuroNata-R, can slow the progression rate on the ALS functional rating scale better than a monotherapy of the drug, the official added.